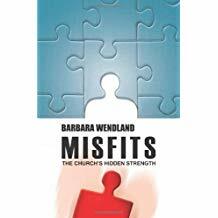 Do you feel like a misfit in the church, as a thinking, questioning person? Are you “spiritually homeless”? If so, you’re not alone! See these issues of Connections— Feb 2002, Apr 2002, June 2002, Aug 2005, Sept 2005, Dec 2005, Oct 2006, Jan 2008, Sept 2008, and Nov 2009, and read Barbara’s most recent book, Misfits: The Church’s Hidden Strength. To get a copy of Misfits, order online today from Amazon.com, or phone St. Johann Press at 201-387-1529 to order with a credit card. Also, you can mail Barbara (505 Cherokee Dr., Temple TX 76504) your check for $24 for a signed copy of the book. To see the Table of Contents and other pages of Misfits, click here to go to its page at Amazon. To see the Table of Contents and some other pages of this book, click on this link to go to its Amazon page.